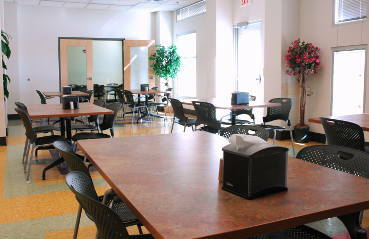 Our cafeteria provides meals to our patients, staff, and guests throughout the day. Under special circumstances, it is possible to arrange for a guest tray to be sent to a room so that a patient may share mealtime with you. Please notify the nurse well in advance, and he or she will inform you of the cost and procedure. Breakfast: 7:15 a.m. to 9:30 a.m. Lunch: 11:30 a.m. to 1:00 p.m.
Dinner: 5:15 p.m. to 6:00 p.m. 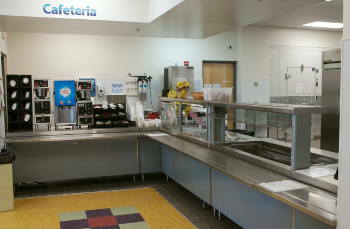 If you have any questions regarding what to choose, please ask the cafeteria server for assistance. Vending machines with snacks, sandwiches, drinks, and fruit are accessible in the OR/OB waiting room 24 hours a day. A microwave oven is available to heat food from 7 a.m. to 6:00 p.m.
We take pride in the quality and value of the food we prepare for our patients. Each meal is prepared as requested and will be served hot and fresh. Your satisfaction is a top priority, so feel free to contact your nurse/caregiver with any needs you may have. Condiments include margarine, regular or sugar free jelly.